This newly built home is in one of Silverton's finest neighborhoods, situated on Cement Creek. Modern, colorful alpine home in quiet neighborhood on cul-de-sac. 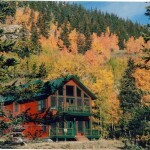 Great mountain views from every room (sleeps 10) Steam shower and Jacuzzi tub. Porch and balcony overlooking Mineral Creek and park. In-floor heating and gas fire-place. Hi-speed internet and cable TV. Richey’s has 2 full baths, 4 bedrooms furnished with 1 king, 1 queen, 1 double, 3 twins, and a regular couch. All rooms have TV’s. 2 new couches in the living room as of July 2018 make for comfortable lounging. The master bedroom includes a large living area, couches, TV, mini-frig, and sink. Other amenities include Jacuzzi tub, steam shower, washer/dryer, dishwasher, cable TV, internet, and 2 decks.